Given a digital workplace is undeniably the future we are rapidly heading towards, the skills any future employee will need to be effective and remain market-competitive is an important consideration for HR and talent managers. HR functions have had first-hand experience of resistance from executives to hand over strategic accountability, mainly because their business skills and acumen have been lacking. The HR function is not immune to the disruption of modern technology; in fact, the advent of Cloud and SaaS technologies in the HR space is ahead of many other business functions. It’s an advantage that HR leaders should capitalise on to secure the relevance of the function in a digitally minded work environment. 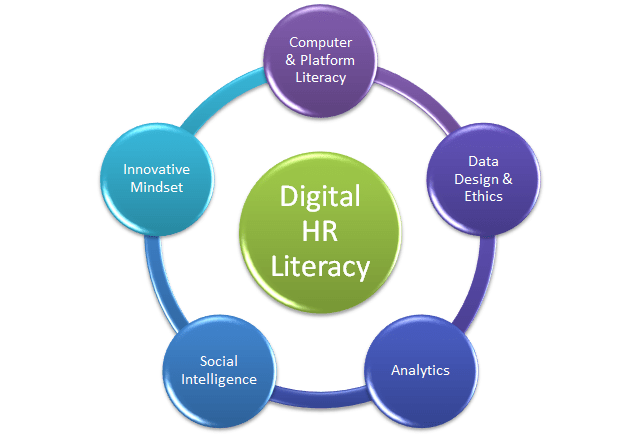 Being digitally literate for HR is a prerequisite for the next wave of business transformation. So what are the competencies, knowledge areas and behaviours required to ensure HR professionals can deliver optimised future service? I have identified five focus areas, each of which houses a number of different subsets. This competency area is often mistaken as the equivalent of digital literacy. Rather, this skill set is a predecessor of digital and includes understanding how desktop PCs, laptops, smartphones and tablets work. This includes how these systems are best consumed and how they connect, and managing software applications. For many, these are skills associated with IT specialists. These skills are no longer an IT domain but have become general business skills which form a fundamental base to foster digital innovation and creativity. These two components may seem like distant cousins, but how and what data we collect and derive is both a powerful business opportunity as well as one that borders on intrusion, invasion of privacy and manipulation. This skill set involves an understanding of other disciplines such as marketing and finance, as well as how things such as graphics, video, Internet of Things (IoT) feeds and other non-transactional data are integrated and designed to produce evidence-based outcomes. Analytic skills are closely aligned with data design and ethics. It’s far more than producing quality outputs, which is increasingly becoming a science in itself, and has a strong emphasis on ensuring the right information is being analysed and interpreted to inform business- and people-related decisions. Just as HR faced rebuke by becoming pseudo psychologists with off-the-shelf psychometric assessments, this skill set is embedded in formal data-science education. Social tools are ubiquitous and increasingly straddle our private and work lives. Understanding how search, content and social media work together requires technical understanding such as SEO as well as strategic alignment and tactical execution skills. Creating, observing and responding activities are reliant on a creative mindset, communication, writing and PR skills. SaaS solutions as well as hardware are continuously being updated and improved, to the extent that new features are being “dropped” by the vendors every few months. Ignoring new features and capabilities for extended time periods is not a good strategy; rather, HR should embrace an agile and continuous improvement approach to its operating model. Skills relevant to support innovation include novel, critical & adaptive thinking, problem solving and design concepts. Most seasoned HR professionals won’t fall into the “digital native” category, meaning that many of these concepts will be foreign and confronting. However, upskilling and introducing new competencies into the HR function will ensure digital transformation initiatives are executed with insight and purpose. The next wave of business transformation will develop around the creation of a digital work ecosystem. Being digitally literate is not the same as being computer literate. It’s about understanding the creation, consumption, management, manipulation and interpretation of information across multiple platforms to achieve business goals. HR should capitalise on their lead in Cloud and SaaS technology deployments to further develop their digital skill sets and influence. Some digital literacy skills – such as being computer literate – are general competencies; others such as data analysis are specialist skills supported by formal qualifications. Digital skills should be spread across many HR roles, rather than thinking they are inherent in a single individual. Posted in digital, Future HR and tagged analytics, Competency, digital, Ethics, HR, Platforms, Skills, technology on 12 February, 2016 by Rob Scott.